“War does not determine who is right – only who is left.” Quote attributed to Bertrand Russell. It was on 21st January 1919 that two Irish born Roman Catholic RIC constables, James Alec McDonnell and Patrick O’Connell, were escorting a horse drawn cart containing gelignite from the Tipperary town Military Barracks to the local Soloheadbeg Quarry, a distance of 7.7km or just 10 minutes modern day driving time apart. The driver of the cart was James Godfrey, accompanied by Patrick Flynn, the latter a County Council employee. Constable McDonnell, a native of Belmullet, Co. Mayo and father of seven children, together with comrade Constable O’Connell, latter a native of Coachford, County Cork and unmarried, were both guarding this cargo of explosives. Pictures come courtesy of the Sweeney family. History records that possibly up to eight armed and masked men, members of the then Irish Volunteers from the South Tipperary Brigade, which included their leader Séamus Robinson, Sean Tracy, Dan Breen, Sean Hogan, Tadgh Crowe, Patrick Dwyer, Michael Ryan, and Patrick McCormack opened fire on the Constables, killing both men. Volunteer GHQ had not sanctioned this ambush. The driver and County Council worker were left unharmed. In the pocket of Constable McDonnell’s uniform were 30 electric detonators which remained undiscovered by their assailants. Hogan with Treacy and Breen drove the cart together with the explosives away from the scene. Eye witnesses later saw the cart being driven at high speed in the direction of Dundrum village, County Tipperary, and indeed the horse and cart minus its contents were later found abandoned at Allen Creamery near Dundrum, by the District Inspector of Clonmel Poer O’Shee. The picture directly above shows; Back Row: – Bonnie, Alden & Doug Rohrer from Texas. 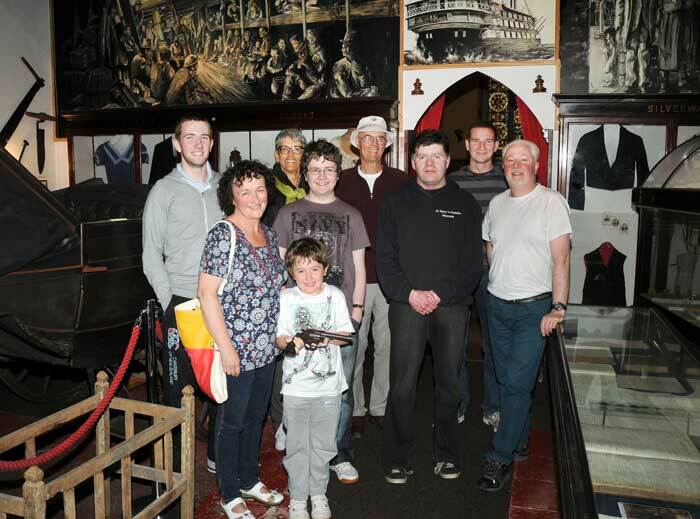 Front Row:- Aileen Sweeney (Left), her husband Roy (Right), with their children Neil, Eoin & Blaine, & St Mary’s Famine Museum, Thurles, guide Stewart Willoughby. A major historic event took place in St Mary’s Famine Museum in June of this year 2013, which truly should have demanded a far wider audience. It was the visit by Mrs Aileen Sweeney, latter the great granddaughter of James Alec McDonnell, the first victim of the War of Independence against England, together with her immediate family. Picture above shows McDonnell’s great, great grandson holding the gun, a Colt 45, which killed his great, great grandfather and possible the gun which fired the first shot which began the War of Independence, eventually leading to brother fighting brother, in an ensuing civil war. The real true facts of this incident now lie forever buried. “I have read many versions in your paper of the “Soloheadbeg Murder,” and the many people who profess such accurate knowledge of what took place. I cannot keep silent any longer. As a son of one of the policeman killed I can give the true story. My father, Constable (James) McDonnell, was an old man of 65 years and was due to retire on pension in a week’s time. He had a large family, one (myself) a cripple on crutches. His wife was paralysed for years and was confined to a wheelchair. That day he was called upon, as a usual routine duty, to guard a cart of gelignite and, as he suffered from corns, sat up on the cart for relief. Suddenly they were halted by Dan Breen and his companions and shot immediately. When my father’s body was taken in we found he was shot in the back. What a glorious act to go down in history! My father was a good man and loved and respected by all the people there. Many times I saw him bring farmers, with too much drink taken on fair and market days, leading their horses and cars outside the town so as to avoid others arresting them. While most of us hold the theory that there are two sides to every issue; one side being right and the other being wrong, somewhere hidden in the centre of conflict can be located some aspect of evil. For me personally, I have long ago learned that there are inevitably three sides to every story. There is yours, theirs and the incontrovertible truth. Like Aileen Sweeney, I too am the great granddaughter of James McDonnell. I am the granddaughter of Michael Alphonsus McDonnell, James and Anastasia’s youngest child. After Soloheadbeg left the McDonnell children orphaned, the family split up, to be taken care of by various family members across Ireland. Eventually Michael McDonnell emigrated to the United States, and the rest for me is history! While Soloheadbeg is a historic event for Ireland, the McDonnell’s cannot overlook, first and foremost, how our family was deeply affected, and shaped our future. I thoroughly enjoy viewing pictures of our great granddad, and would appreciate seeing any more that you may have. My husband and I had the great privilege of visiting James Alec’s grave in Tipperary in October 2012. Thanks, Cathy McDonnell McQueen, U.S.A. Please contact me re the above. I live in Tipperary and part of a committee which wishes to remember the lives of all who participated in the Soloheadbeg ambush. I am also the great grandson of of James McDonnell being the grandson of his son James. Of his other daughters sadly Eileen (Highland) and Barbra (Zink) are no longer with us. Barbra moved over to the USA with her husband and had 3 boys, my cousins who we regularly keep in touch with. There are two stories I would love to know if are true about James :- it was said that he would often visit pubs and challenge those there to a pint of beer by asking them to spell Chrysanthemum! The other story I would like to know more about is at the inquest of his murder one of his sons stood up and shouted “he was never given a chance!” Later in his book Dan Breen suggested that they only fired on the constables in self defense. As great grandchildren of this man we have all taken up his surname within our own to honor him. James McDonnell was my Great Grand father. I Grand father Joseph McDonnell and my mother Barbara McDonnell. I live in the States. It would be nice to have a reunion states bound- so much I would like to know. My mother passed in 1984. My sons middle name is Donnell in memory. Christopher McDonnell’s wife Bridget McGrath, would anyone know who her parents were???? Could you contact me if you’re having any form of memorial next year. I’d like to be there. My name is Ronan McGreevy from The Irish Times. I would like to use that photograph of James McConnell for a supplement we are doing on 1919. Bridget McGrath was the daughter of John McGrath of Glengad. My great grandfather George Irwin, from Lenerevagh, married Mary McGrath from Rossport and an Ellen Irwin who I believe to be his sister married Alec McDonnell. Trying to work out the relationships! Just wondering where exactly Constable James McDonnell was born? I know it’s Belmullet. Where did Christopher go to when his father died? Hi, My name is Con O’Laoghaire. My Grandmother was a daughter of James McDonnell. She went into service in various houses after his death before marrying my Grandfather and settling in Harty Place, Dublin. She had three children Imelda, Shea and my father Con.